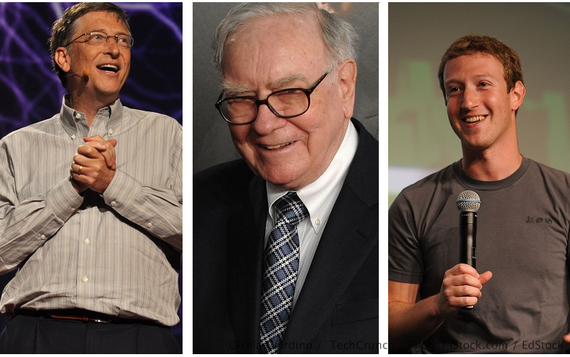 Last month, Forbes released its annual list of the top U.S. billionaires. Admission to the top billionaires club was harder than ever with the lowest net worth sitting at $1.7 billion, up $150 million from one year ago. Combined, the top 10 wealthiest Americans on Forbes' list are worth over $460 billion, just a few billion shy of Taiwan's GDP. 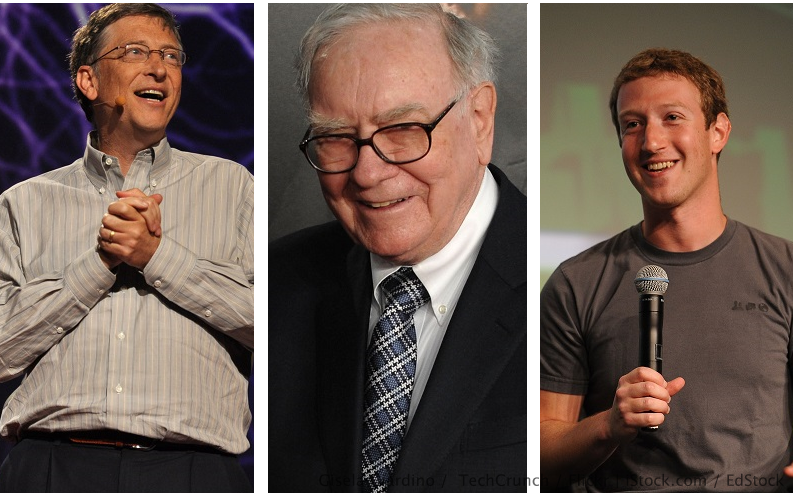 From Warren Buffett to Mark Zuckerberg, here's a rundown of where the top 10 U.S. billionaires were born and how they became so rich they could buy a country together. Bill Gates was born on October 28, 1955 in Seattle. Although Gates started Microsoft in Albuquerque, N.M., he moved the company home to Seattle in 1979. Up until 2008, the business magnate worked at Microsoft full-time, leading the $340.8 billion company. Today, Seattle continues to serve as the home base for both the software giant and it's co-founder. Gates lives in a 66,000 square-foot mansion on his Xanadu 2.0 estate, according to Business Insider. With Bill Gate's net worth sitting at $76 billion, the $63 million mansion comes with a small price tag. With more free time, Gates has turned his attention to The Bill & Melinda Gates Foundation which funds global health projects like drought-tolerant seeds, malaria vaccines and telephone banking. Known as the Oracle of Omaha, the CEO of Berkshire Hathaway has his roots in -- you guessed it -- Omaha. Warren Buffett got his start selling soft drinks and delivering newspapers. The young investor made his first investment at just 14 years old, when he purchased and rented out 40 acres of land, according to Investopedia. Buffett later left home to attend the University of Pennsylvania, transferring to the University of Nebraska after two years. He went on to attend Columbia University for graduate school and returned to Omaha upon graduation to work at his father's brokerage firm. Despite Warren Buffett's net worth of $62 billion, the investor lives in a modest five bedroom house he bought in 1958 for $31,000. Before Larry Ellison founded Oracle -- one of the largest database software firms in the world -- he lived in a low-class Chicago neighborhood. During an oral history for the Smithsonian Institution, the entrepreneur recalled an issue of Look Magazine that called his neighborhood the oldest and most crime-ridden area in the U.S. But Ellison eventually left his neighborhood and went on to become a multibillionaire. His rise to riches was not without stumbles, however. Ellison attended and later dropped out of both the University of Illinois at Urbana-Champaign and the University of Chicago before moving to California. Ellison got his big break in 1977 when he left his job at Ampex to start Oracle. A private golf club in Rancho Mirage, Calif. The historic Astor family home in Newport, R.I.
Jeff Bezo's net worth is $47 billion. The Amazon founder grew up in Albuquerque but first found success as a Wall Street investment banker at D.E. Shaw & Co. Though he was on track to climb the company ranks, Bezos left the firm in 1994 to pursue a passion in online retail. What he created was a little-known virtual bookstore called Amazon. Pursuing his dreams of growing Amazon, Bezos moved to Seattle, where his company would have close access to Ingram Book Group's Oregon warehouse and a deep pool of high-tech talent. After raising $1 million in startup funds, he rented a house in the city and set up shop in his garage. The rest, as they say, is history. Billionaire industrialists and brothers Charles Koch and David Koch might have been born into the upper crust of Wichita society, but their father put them hard at work milking cows, digging ditches and mowing lawns, according to Daniel Schulman, author of "Sons of Wichita: How the Koch Brothers Became America's Most Powerful and Private Dynasty." Even during Wichita's brutal summer months, the brothers would spend their days working the land while their peers were playing at the country club. Charles was even sent to boarding school at age 11. But while the two might have had a childhood full of chores, the payoff was huge. The Koch brothers are now tied for the fifth spot of America's top 10 billionaires; both Charles Koch's net worth and David Koch's net worth are estimated at $41 billion. While Charles Koch serves as CEO of Koch Industries, his brother David serves as executive vice president. David is known as New York City's richest resident, holding $115 billion in Koch Industries shares with his brother Charles. The two are also well-known lobbyists, spending nearly $900 million on everything from political activity to criminal justice reform. Mark Zuckerberg's net worth is $40.3 billion. The Facebook founder and CEO was born in Dobbs Ferry and later moved to Massachusetts to attend Harvard. In 2004, Zuckerberg dropped out of Harvard and took his newly-created company Facebook to Palo Alto, Calif., where the social media network grew to international fame. In 2014, it was reported that Mark Zuckerberg and his wife, Dr. Priscilla Chan, were building a $10 million mansion in San Francisco. Over $1.5 million has since been spent on building new bathrooms, a wine room, a wet bar and media room, making for one stellar party house. Politician, philanthropist and billionaire businessman Michael Bloomberg was born in Boston. He left home to attend Johns Hopkins in Maryland before moving on to Harvard. In the 80s, Bloomberg made billions building a financial computer that changed the way securities data was stored. Later, he turned his attention to philanthropy with an emphasis on medical research, the arts and education. He also served three terms as New York City's mayor before leaving office in 2014. Today, Michael Bloomberg still calls New York home though he has properties across the globe, including the Hamptons, Westchester County, Colorado, Bermuda and London. Bloomberg's net worth is estimated at $38.6 billion. Jim Walton is the son of Sam Walton, the founder of Walmart and Sam's Club. With a net worth of $34.6 billion and the No. 9 spot on this list of billionaires, Forbes estimated Jim Walton holds a 12.8 percent stake in Walmart. The businessman also serves as CEO of the family's Arvest Bank, which has branches in Arkansas, Kansas, Oklahoma and Missouri. Walton was born in Newport and now lives in Bentonville, Ark., with his wife and four children. Bentonville is also home to Walmart, the world's largest company. But Walton didn't grow up rich -- he was a small-town kid whose dad happened to own a number of successful stores. This lifestyle is reflected in the Walton family. Despite controlling about $90 billion worth of Walmart stock, the family remains incredibly tight knit, understated and drawn to Sam Walton's commitment to plain living. East Lansing, Mich., native Larry Page was born to computer experts, so it's no surprise he was drawn to computer technology. After earning his bachelor's degree in science from the University of Michigan, Page left his home state to study computer engineering at Stanford University. There, Larry Page met Sergey Brin, who helped him develop Google. In 1998, after raising $1 million from family, friends and investors, Google officially launched. It has since become the world's most popular search engine. After the company's first initial public offering in August 2004, Page became a billionaire. Since 2004, Page's net worth has skyrocketed to $33.8 billion. Both Larry Page and Google are still headquartered in California's Silicon Valley. As a clean energy advocate, Page maintains a network of houses in Palo Alto that use fuel cells, geothermal energy and rainwater capture. This article, See Where the Top 10 American Billionaires Were Born, originally appeared on GOBankingRates.com.